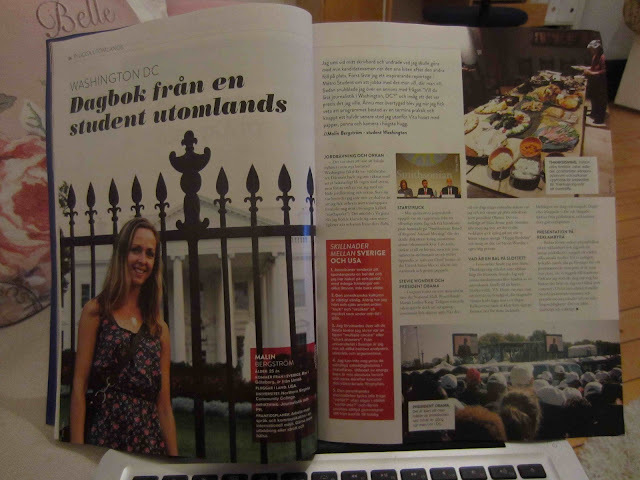 Milon in Washington DC: My story about DC – published for students-to-be. My story about DC – published for students-to-be. A little while ago, I was putting together a short text about my year in the US, my life as a student and intern in DC. Yesterday, the printed story was to be found in my mailbox. And the timing couldn't have been better. Lately, I've been having such DC cravings, it's almost ridiculous. I found the American shelf in my local grocery store and I almost started crying from the sight of Reese's and 3musketeers bars – among other goodies. I listen to Gil Scott Heron singing "Washington, DC" and I almost think it's a great song – for real. Tuesday night, I held a short presentation about my program and answered questions and mingled with enthusiastic students-to-be. When they asked me if I miss the city, I told them that Oh My God I do. I had to refrain myself from becoming too emotional. So, receiving this magazine with a story that I'm actually very satisfied with, came as a perfect Friday gift. For you Swedish speaking people, the online version is to be found RIGHT HERE, on pages 24-25. And for all you non-Swedes, you can simply run through the archives of this blog. Here you have the whole picture.